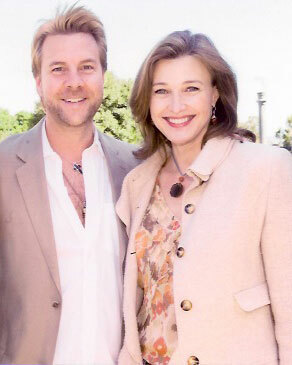 I met Brenda Strong many years ago when she was starring on Desperate Housewives and I was overseeing corporate philanthropy and pro-social marketing for the ABC Television Network. Once we met, we became fast friends, not because of our roles in television, but because of our mutual desire to help others. Here, Brenda shares what I think is a beautiful story that illustrates how being of service can prepare us for situations to come, in this case saving someone’s life. This is an abridged version of Brenda’s story, the full story, including her amazing work to help those battling fertility issues, will appear in my upcoming book, Soul Serving. by: Brenda StrongWe all give because we care. We give because it means something “out there” moved us internally and we see a need. Often it is a cause we’ve been touched by because of an inequity, disease or circumstance in our own family or community that has raised our awareness and we want to make a difference. But we also give because there is a more personal stake. Recently, I was having an exam at a cardiologists office in NYC (because I have genetic based high cholesterol) and the doctor (and I) was worried that my scores may lead me down a similar path as my mother, who led a healthy lifestyle but had a massive stroke at 67 that changed her life. Mind you, this is the same cardiologist that I served beside 5 years before on the board of “Events of the Heart,” an organization committed to raising awareness around the risk factors of women’s heart disease. Events of the Heart helped educate women through the impact of personal “stories” written by award winning writers and read by celebrated actors. We fondly called them the “angina monologues” in private. They were personal stories about women with heart disease and they entertained and educated women simultaneously. I had worked with them for years, as I didn’t want other women to lose their mothers as I had needlessly. Now, I am going to admit something to you. While I prefer pretending all is well, and that heart disease happens only to others, I have been getting some whispers to pay attention to my own heart health. Luckily my EKG and Echo Cardiogram look like the yogi that I am, but my mother and her lineage gave me high cholesterol and I can’t ignore that – it’s real. So the doctor sent me to check to see if I had any calcium build up. The irony wasn’t lost on me as I waited back in the radiology waiting room to see if MY heart was okay, that we teach what we need to learn. So there I was at the crowded reception room on the 12th floor at Lenox Hill Hospital, waiting for them to call my name and the elderly woman sitting next to me was having a hard time. I offered her daughter my seat as I could tell she was concerned about her Mom and the room was packed full. She politely declined. I tried to mind my own business, but she kept asking her mom if she was okay, reminding her to breathe, asking if she wanted some water. She asked her mother if she thought she should go to the emergency room – and the mother hazily agreed. She couldn’t get up to walk, so her daughter asked the receptionist for a wheel chair. There wasn’t one to be found in the emergency room when she called down to the first floor. The daughter wanted to go look for the chair herself, so I offered to stay with her mother, when the receptionist said the concierge found one but they couldn’t bring it up. The daughter asked the mom if she could go get it and she said no, she didn’t want her to go just yet. The daughter asked what she was feeling, and after some trouble she said she felt nauseous. Now, I know from all the work I’ve done with Events of the Heart that nausea is one if the ways a woman’s heart attack presents. Unlike with men, it’s not as obvious as pain shooting down the left arm. I looked at her daughter and I pointed to my heart and quietly asked if her mother had a history of heart issues. In the time it took her to nod we were both on high alert, I was out of my chair saying “I’ll get the wheelchair” and I was in the elevator going down 12 floors to retrieve it. You see, shortly after my son was born, my mother had cardiovascular issues, a stroke and subsequent heart attacks, and because I knew the risks (and my way around a wheel chair), I moved before I could think. I grabbed the chair from “Ken the concierge” and raced back to the 12th floor. Once we got her in the chair, she gently squeezed my arm as an acknowledgment and I told her to take care. They rushed off to the emergency room and within seconds the reception desk immediately called my name. After handing them my paperwork, long story short, it turns out I was in the wrong place. The place for the calcium score was in the building next door and I had waited 45 minutes for nothing. But, it didn’t take me long to realize that there are no mistakes, everything is perfectly imperfect, and I know for a fact that I was in exactly the right place at the right time. And as slightly annoyed as I was to be in the “wrong” place, I was deeply grateful I was there because I felt I made a difference for them in some small way that day. It made me feel good to be of service. So, why do we give? We give because we inherently get value from the act of giving. But we also give because it feels good. The gift of giving is something I believe in. We lead by example, and whether the gift is your time, your money, or your voice, it is the act of giving that connects us to life in an expanded way. My advice? Find something you care deeply about and dedicate yourself to give it your energy. Brenda’s full story, as well as many more stories of personal growth through service, will appear in my upcoming book Soul Serving. I am so thankful to Brenda and everyone else who’s contributed to Soul Serving. This is the last weekend for the campaign, and while we have a long way to go, I’m grateful for all of your support in getting to this point.